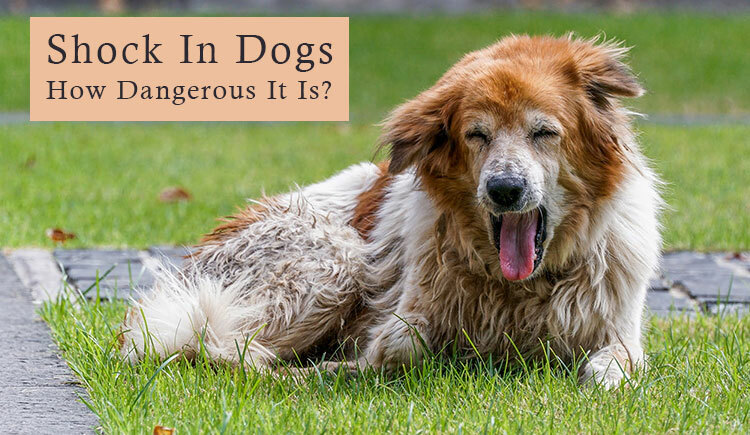 Shock In Dogs: How Dangerous It Is? What is Shock in Dogs? Shock is a condition when the body gets into the survival mode and inhibits the blood flow to other parts of the body and pools it into the vital organs for supplying adequate oxygen for survival. It happens when the blood volume drops drastically and there is not enough pressure to supply oxygen to the nerves leading to external tissues. Thus, in order to keep up the pressure from falling, the body increases heart rate and goes into the starvation mode which can be life-threatening. Dogs can go into shock due to extreme blood loss or low blood pressure but what causes this loss or drop in pressure? Well, there are several reasons that lead to low blood pressure or low blood volume. Loss of body fluids due to diarrhea, burns, major cuts that bleed profusely and, or vomiting. Insufficient amount of blood pumped by heart due to functional or physical deformity. Reaction of the body towards an allergen that leads to higher production of histamine. The dog may seem uneasy or may become quite anxious. His gums may become flushed with blood, appearing stark red in color. If you see any of these signs in your dog, take him to the hospital immediately. Put a pillow or a folded blanket under his lower back to increase the blood flow to heart and brain. Keep him warm by covering him with a blanket because cold weather can accentuate the risk. Do not feed him anything in the situation. Shock can lead to terrifying consequences when not treated in time. So, now that you know what to do and what signs to look for in a dog, stay alert and be cognizant of his health if he has recently undergone a surgery or trauma because your dog might need help anytime.